From August 22 to 26, 1992, as many as 1,200 violent right-wing hooligans, most of them youths, rioted in front of the hopelessly overcrowded Central Home for Asylum Seekers in Rostock-Lichtenhagen. The incident represented the most severe outbreak of xenophobic violence in Germany’s postwar history. To the applause of up to 3,000 curious onlookers and in front of rolling TV cameras, rioters threw rocks and flaming materials at the high-rise building, which was mostly inhabited by Romanians. Afterwards, they also set fire to the adjacent building, a residential home for Vietnamese guest workers [Gastarbeiter], and then attacked the residents as they fled. The local police force was completely overwhelmed by the riots and only managed to get the situation under control on August 25 with the help of external police units and water guns. A parliamentary fact-finding committee later investigated the police’s complete inability to deal with the situation. This photo was taken on August 24, 1992; it shows curious onlookers in front of the flaming building that was once home to more than Vietnamese 100 workers. 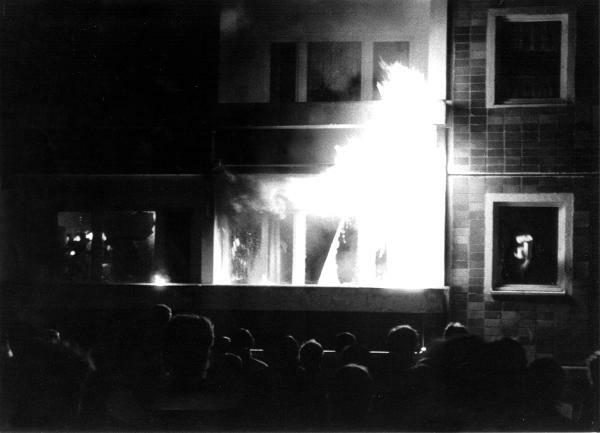 The perpetrators of the Rostock riots were tried in about 40 different court proceedings and given juvenile sentences of up to three years. Photo: DB Treder.